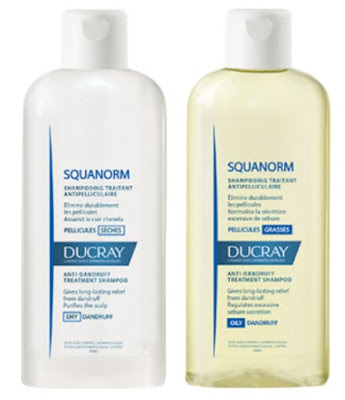 Fight the flakes with Ducray Squanorm Anti-Dandruff Treatment Shampoo! Squanorm Dry Scalp Anti-Dandruff Treatment Shampoo - 200ml - $20.99 - with a creamy texture that provides rapid, long-lasting action thanks to specific loose dandruff ingredients including: active guanidine glycolate; pyrithione zinc; and glycerin that eliminates loose dandruff, moisturizes the scalp and relieves scalp discomfort. Squanorm Oily Scalp Anti-Dandruff Treatment Shampoo - 200ml - $20.99 - with a purifying cleansing base that gently washes the hair and scalp, using a complete formula containing: active guanadine glycolate; piroctone olamine; sabal serrulata extract; and bisabolol to eliminate loose dandruff, relieve itching and absorb excess sebum secretion. Both offer long lasting results that start from the very first application - loose dandruff is eliminated and hair regains volume and shine and is soft and easy to detangle - best of all, no medicated small - just a soft and delicate fragrance that doesn't feel the least bit medicinal!